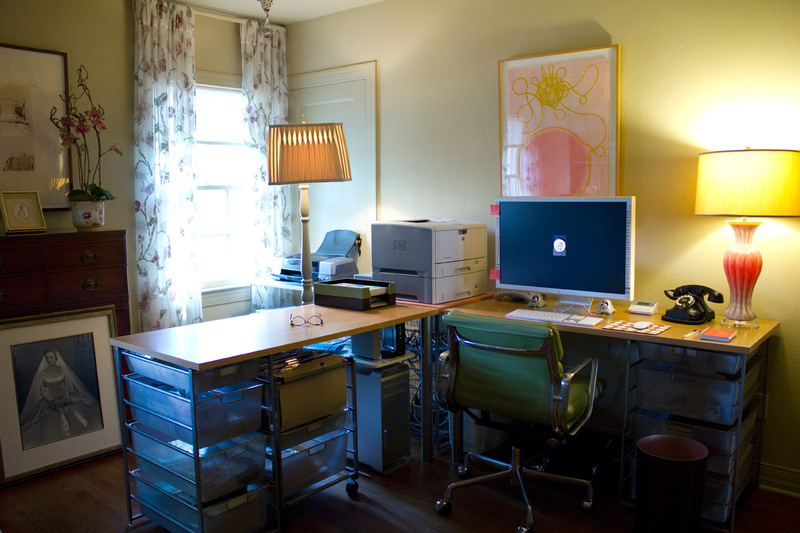 Finally I was able to photograph my newly decorated office. For several weeks now I’ve been waiting for the sun to stay consistently bright from 1pm through 2pm in order to take these photos. Unfortunately, while waiting, the oak tree fully leafed out causing the light to not be as bright as it would have been while the tree was dormant. The sun wasn’t my only problem. With two other very different light sources, incandescent and fluorescent, I ended up having some strange color issues, which I will gladly point out to you in the following photographs. 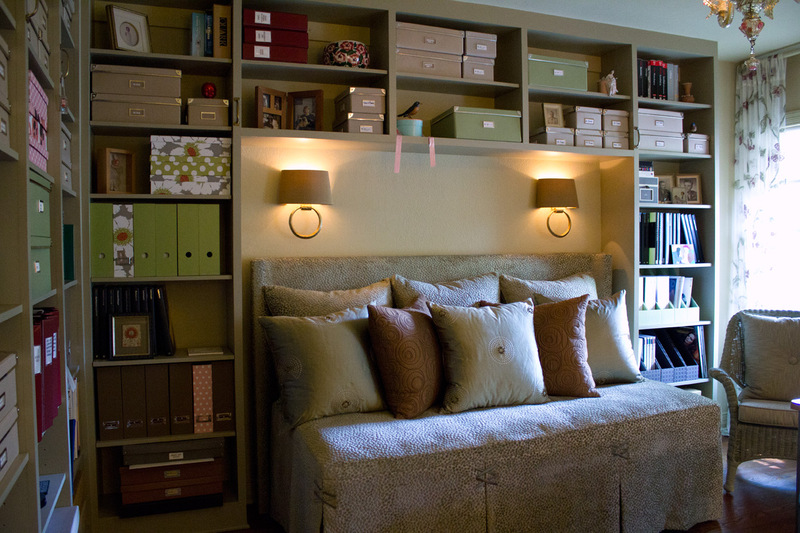 (above) The built-in shelving was designed to include an alcove for a daybed. (above) Every box that you see is being used and has an important purpose. You see, I had a plan, and that was to be highly organized when entering my golden years. (above) Here is a very good example of the difference between incandescent and fluorescent light. 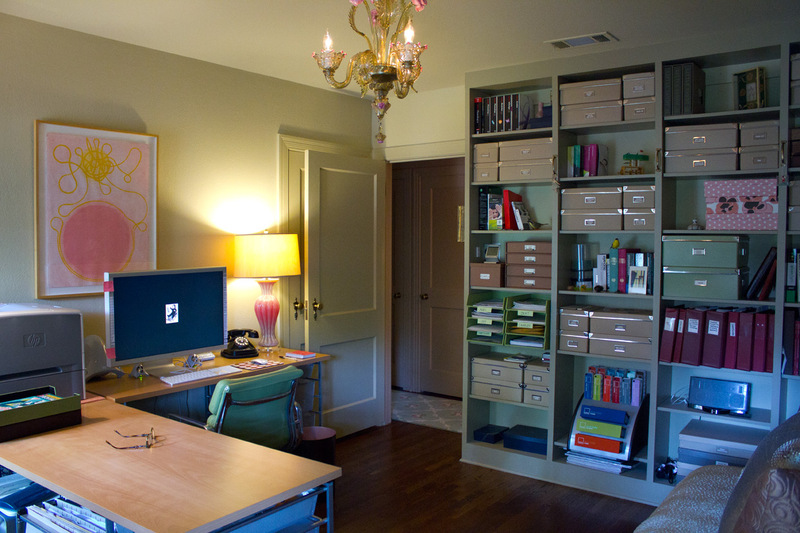 On the right, notice the ghastly green/yellow cast that the desk lamp throws out. This lamp has a “warm” fluorescent 3-way, which is still better than the old fashioned blue tone fluorescents. Now notice the difference in the wall color on the left nearer the window. The left side reflects the true colors of the room. In hindsight, I should have replaced the fluorescent with an incandescent before taking any of these photographs. (above) Here’s a view looking towards the room’s entrance at the hallway. 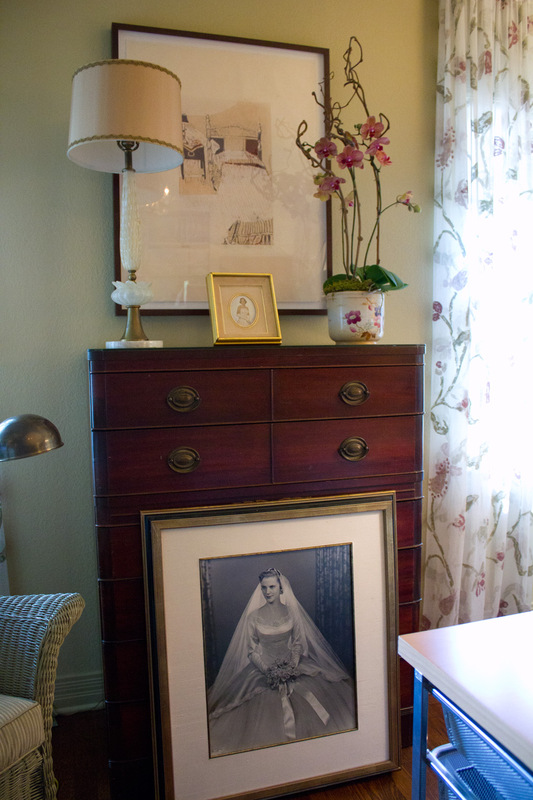 (above) Here’s detail view of an old family bureau with my mother’s wedding photo propped up in front. Hung above this old piece of brown furniture is a reductive woodcut I did about twenty years ago. 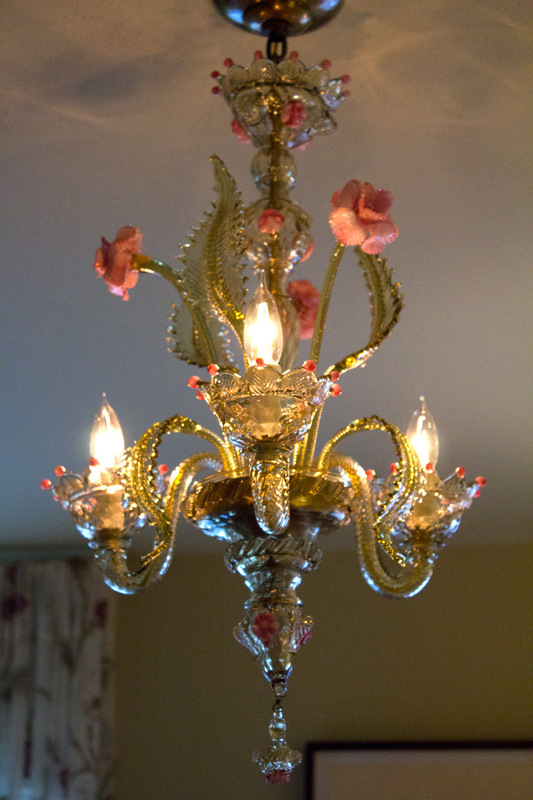 (above) I purchased this Venetian chandelier in Murano, Italy back in 2001. Keep in mind, that I did this before I knew they were to become a fashionable replacement to the traditional crystal chandelier. I spent two weeks in Venice exploring as much as I could—one week for La Biennale di Venezia and another week for everything else. This chandelier was purchased at Vetreria Colonna Fornace. It was one of the first glass shops I was to visit, and it was love at first sight. It’s just wonderful, Patsy Ann! I’m reorganizing my loft/workspace at the moment myself. 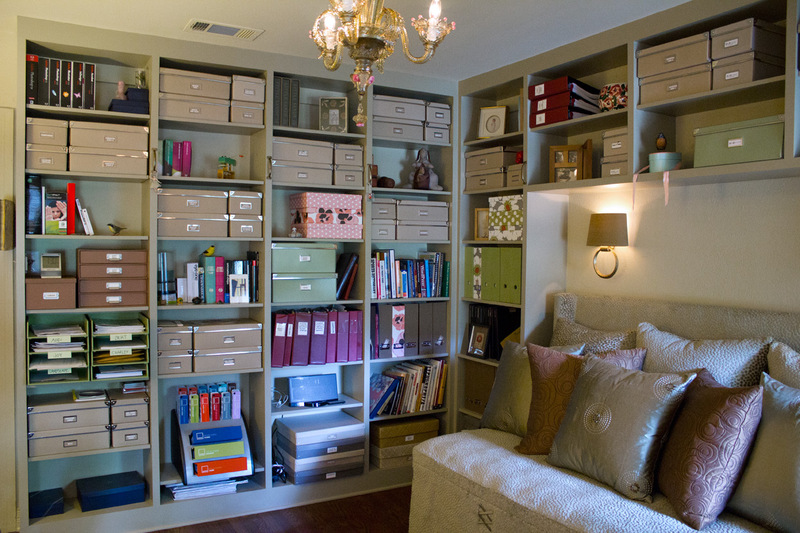 I’m quite envious of how beautiful and wonderfully organized yours is and that yours is finished!! I also love your mixture of old with new; I reuse dressers in other rooms too. Nothing like the feel they give. Thanks, Baby Girl! Having all this shelving and boxes to reach has helped me hone my never-used-before-climbing skills. If you look closely, you’ll notice generous brass cabinet handles placed two thirds the way up on each vertical partition. They’re to swing from when my step ladder decides to move away from me. I love this room! How did you do the daybed or where did you get it? Does it have a trundle? Where did you get the sconces? Just beautiful! Thank you, Blair! 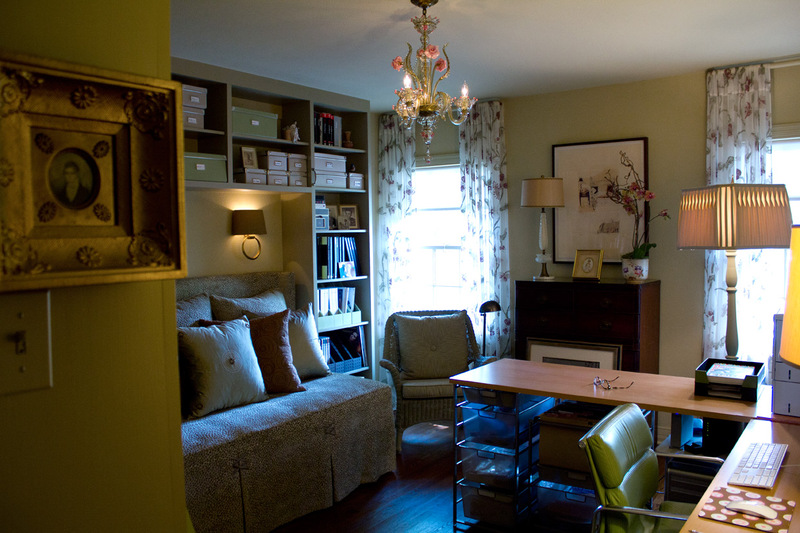 I had a wonderful architect/designer, Charley McKenney, who helped me with this. The daybed itself is just your ordinary twin bed with no trundle, nothing special. But the back fabric panel and covering were custom designed by Charley. The sconces are Porta Romana which is represented here in Dallas at Culp Associate’s showroom.